Brother Lawrence, born Nicolas Herman in Hériménil, near Lunéville in the region of Lorraine, in 1611, was a former footsoldier and valet who entered the Discalced Carmelite monastery in Paris as a lay brother, taking the name “Lawrence of the Resurrection”. His serene piety drew attention, and he was eventually interviewed in person, and through letter, as to his method of the Christian life. His conversations and letters were published a year after his death in 1691 under the title The Practice of the Presence of God. This book has been commended by men such as Wesley and Tozer, and most Christians who have read have come away aspiring to its themes, at the very least. 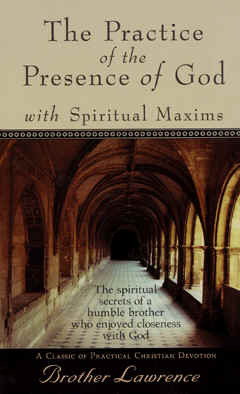 The heart of the book is that “ we should establish ourselves in a sense of God’s Presence, by continually conversing with Him. That it was a shameful thing to quit His conversation, to think of trifles and fooleries. That we should feed and nourish our souls with high notions of God; which would yield us great joy in being devoted to Him.” Lawrence explains to those asking his simple mode of continually conversing with God, of learning to do the most mundane thing for the love of God. Here and there, Lawrence’s Catholic errors pop up, but are mostly submerged by the wealth of helpful thoughts. Taken wrongly, this book would be an exhortation to a neurotic, obsessive kind of continuous prayer, a burden no one could bear. Understood in light of the last quote, it is a warm exhortation to a grace-enabled continual prayer life: living life in His presence, often returning to Him thanks, requests, praise and other contemplations. I am becoming very disturbed by this website's direction toward contemplative mysticism. First, I see that the store offers the book "On Loving God" by mystic Bernard of Clairvaux. Now you publish this article promoting Brother Lawrence. I used to recommend this site. Now I'm afraid I'll have to start warning people against it. Here's an article on Brother Lawrence that you should read: http://www.lighthousetrailsresearch.com/brotherla… And if you Google Bernard of Clairvaux you'll find all kinds of reasons not to promote his writings. Please, stop leading people astray with this stuff. They could easily become involved in occult practices – very dangerous! I appreciate your desire to protect believers from error. I also share your concern regarding much of the modern contemplative movement. However, here are a few things to think about, which might explain why I would recommend reading Brother Lawrence. Second, the writer of the article you linked seems to base his/her argument on guilt by association: which order Lawrence came from. (He also has some inaccuracies regarding Lawrence's 'ecstatic' experiences – none of this appears in his own writings.) I would encourage you, if you haven't done so, to read Lawrence's work for yourself. If you find him encouraging the notion of emptying our minds so as to enter into non-rational union with God's essence, then we have a problem. Instead, we find Lawrence calling for a life of rational love for God, expressed in continual (not continuous) prayer. Third, just as false teachers quote the Bible for their own purposes, we should not be surprised if the contemplative movement happily quotes Bernard, Brother Lawrence, or Francois Fenelon in support of their teachings. This should not blackball these writers; we should take them on their own merits. Richard Foster likes Lawrence for one reason; I find value in him for (mostly) different reasons. Where we find error, such as we will also find in Owen, Torrey, and Chafer, we recognise and reject it. Where there is more wheat than chaff, a work becomes of interest to Christians in general.